There was a time when I would rather take a 2×4 full of rusty nails and jam it through my neck sideways than try and use Cinelerra, but the more obstinately I mercilessly force myself to keep using it, the cooler the stuff I am able to do. Now, don’t confuse that with me having delusions of talent. It’s just that I can find the cooler features of the program. For what that’s worth, take a gander at the video, and see if you get the joke. Have a good one. Mobile Linux: The Best Choice for Smartphones? Explain to me the draw people have to technology. Lacking psychology credentials (other than psychosis), I would be unqualified to expound in great detail. That said, there are a few things that I have noticed about people and their attitudes towards computers and other types of electronics. Based on these attitudes and some current trends, I wanted to provide a type of forecast. Where are things going with regards to electronics and the embedded operating systems that run them? To start off, let’s consider the concept of convergence. To put this simply, people love combining functionality of stuff. Take cars for example. Take me from point A to point B. Primary function: transportation. Well, except if it’s 132 degrees outside, then it’s too hot. Put me an air conditioner in there. OK, now we have a duality of purpose: transportation and comfort. Oh, wait. If I am driving from Barrow, Alaska to Punta Arenas, Chile, I will get very, very bored. So, could we throw me a radio into my car, too? My kids will get bored with my music, so give them a DVD player for the back. And let’s have GPS, and a radar detector. All of a sudden, we have convergence of several different technologies into one product. People like to combine things. Next point, we’ll consider a couple of different types of computer users. As an example of the first type, we’ll make up someone called Michael. He likes to play it a little safe, stay in his comfort zone. His philosophy is to go with whatever you know. If it isn’t broken, don’t fix it. He doesn’t like to waste time trying to figure things out. Our fast-paced (and gaining momentum) society encourages users like Michael. Take the tools that you know, and get productive right now. For my second type of user, we’ll make up someone called Duran. He doesn’t like to be restricted with his options. He likes to be free to choose and do what he wants. He doesn’t mind tinkering with hardware or software to get it working the way that fits his needs. He doesn’t mind taking some time to learn about how things work. After all, this does give experience in the future. Michael was likely raised using Windows, just because of sheer statistics and probability. This means that he will want to continue using Windows and would likely be hesitant to change, because Windows fulfills his current needs. His first reaction to Linux will be to reject it on account of its reputation of being hard to use. Besides, it’s different, and that means a learning curve. Michael is not interested. What he has and does works for him already, why change? Duran, on the other hand, doesn’t care about learning new things. As soon as he hears that there’s a free operating system called Linux that may just do what he needs it to, he immediately looks into it. After a bit he gets it up and running. After a month or two, he finds that he can make it do everything he needs it to. He may have to work with it a bit, but he is all good with hands-on. He begins using Linux exclusively. What has happened, now? Let’s consider it for a second. Michael doesn’t even know all that Linux has to offer, because he doesn’t have enough experience with it. He still prefers his comfort zone, and is resistant to change. He continues doing what works for him, and paying a healthy amount for these privileges. Windows isn’t free. Now if we think about it, Duran now has the benefits of both situations, without the drawbacks of the first. Remember, the first type of person likes a comfort zone, likes to go with what you know, and just get productive. This is Michael. Duran now has a comfort zone in Linux and knows how to be productive with it. He gets the benefits of Michael’s situation without the restrictions. He also gets the benefits of being able to set things up however he wants because of the options available to him. Duran grows and learns and becomes more productive as Michael stays the same, a slave to his resistence to change. For a long time, Linux has definitely been too hard for a regular computer user. You know the type, they check email and surf the Internet. Why spend 3 months learning a new operating system just to do that? For most of its life, Linux has been for the hard-core techies only. This is not the case anymore. Read the latest reviews of Ubuntu, Fedora, or OpenSUSE. They are more point-and-click than they have ever been. Linux is now moving over into the realm of Michael. More and more things just work, less and less time figuring out how to get stuff working. Applications are getting much easier to use (OpenOffice, Firefox, Thunderbird). Just install and begin working. 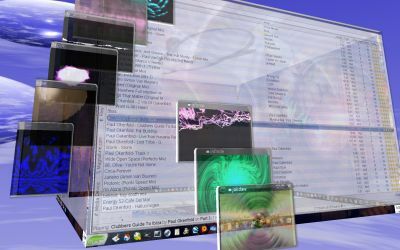 In many cases, LiveCDs even allow us to omit the installation, giving us the power to be immediately productive. We have the principle of convergence, the concept of going with what works, and the concept of freedom of choice. What happens when a company needs a software application? They have two choices: develop it in-house, or buy something pre-packaged. In-house development means that the company has to allocate time and financial resources to develop and test the software. Most of the time, reasons for in-house development stem from a desire to customize it to the exact needs of the company. However, it becomes very expensive in terms of time and money. In the end, the in-house application may or may not be of the same commercial quality as the pre-packaged solution. Likely, it isn’t (possible, but usually isn’t). The problem with propietary, off-the-shelf software is that it’s much less customizable to the company’s needs. They have to wait on the vendor for security updates. They don’t have access to the code to change things around as they wish. The choice then becomes one of two things: Spend a lot of time and money to develop a decent in-house customizable solution, or purchase a well-developed commercial solution immediately but is not nearly as customizable? Let’s complicate this situation. The software will be embedded to power an electronic device, such as a mobile phone. This is the situation that many mobile carriers find themselves in right now. Verizon has usually just flashed their own OS onto the phones sold to their customers. They spent a bunch of time and money to develop a mediocre operating system that fills the need. Decent, easy enough to use, but charge a bunch for extra features. Cellular providers like Verizon need an embedded operating system. So far, the pre-packaged solutions haven’t really been up to snuff for many users, especially the technology-savvy. In-house solutions have been lacking, as well. And remember the convergence concept? Customers are now demanding ever more functionality from their cell phones that is currently not possible for many cellular carriers. The current Michaels are fine with what there is. The Durans, however, are going crazy. These companies need something that already exists, that is tested, proven, and covers the basics. They need something that won’t cost them precious time and money to develop, and will end up being better than what they’d end up delivering anyway. They need something that they can take and modify to fit their needs, and embed it into their phones. Then, they don’t have to gouge the customers for the cost of the development for the OS, and can sell phones that have more functionality for less money. They should also leave the OS open for developers. This will allow people to fill their own demand, as has occurred with Linux as it stands. Then, the Michaels and the Durans will both be happy. Michael can take it standard as it comes and just use it as it is. Duran can get into it, install and remove ringtones and wallpapers. He can install and remove software as he wishes. Verizon’s entrance into the LiMo Foundation is only one thing they’ve done. How about their Any App, Any Device initiative? Essentially, anyone can develop any hardware and have it certified by Verizon. How does Verizon accomplish the Any App part? By using Linux. The LiMo foundation gives them this. And how would they make this possible? How about the C Block of the 700MHz spectrum that Verizon won? Combine all this, and we are going to see some sick hardware and software spew forth onto the scene. Convergence, remember? Maybe we’ll finally have videophones? Virtual Reality Enemy Territory LAN Party over the C Block of the 700MHz spectrum of Verizon’s network, anyone? Think Verizon’s the only one who knows all this? AT&T walked away with a chunk of the 700MHz spectrum, too. You think the current 3G networks are cool? Verizon and AT&T are both developing 4G networks. Forget about whether open source is going to happen, or whether Linux will appear on more than just PCs. It’s already happening. Looks like it might be a good time for those who dig open source stuff to consider Verizon, or any other carriers supporting Android or LiMo. Forget about whether open source is going to happen, or whether Linux will appear on more than just PCs. It’s already happening, and fast. Looks like it might be a good time for those who dig open source stuff to consider Verizon, or any other carriers supporting Android or LiMo. And if you are already using Verizon, I have a free 53-page ebook available on how to get the very most out of being their customer. This ebook makes Verizon’s current phone OS feel like it’s already open source. Plus, it can save you over $300 in accessories and other stuff. How long until we have an open-source main-stream gaming console designed for Linux? I was looking at a 1080p PS3 game the other day. Power something like that with Linux. What about computers in vehicles? We currently have GPS systems. What about throwing Linux on there? Put a Media center in it (mythtv?) along with some open source GPS software. If people want to make it even better, let them. Then, let everyone else have the software updates free. Even more, how long until we can make an Any App, Any Device appliance that certifies with Verizon that does ALL of the above? Proprietary OSes cannot keep up with the demand for diversity. People want too many different things right now. And when the proprietary OSes can deliver something, security and stability are the first things to go, as we have seen with what comes out of Redmond. Open Source can keep up because there are unlimited amounts of people who can work on it. If someone wants something bad enough that isn’t currently provided, they can write it themselves if it’s an open platform. Gates and MS have been going almost 30 years. Linux has been in development just more than half that, and it’s good enough to be displacing hundreds of thousands of MS desktops. When Linux has in production for 30 years, we’ll compare it to how much Windows developed in 30 years. Can proprietary work with mobile phones? Obviously. Will further progress be made faster by everyone working together? Absolutely no doubt. The costs of the initial development of the OS drop drastically. Customers get what they want, making it easier to add whatever they want (which they will, anyway). Michael gets something that’s easy to use, and Duran gets something that he can hack to his heart’s content. Blow me off if I’m totally crazy. But honestly, we have seen Mobile Linux predictions before. People want something that will just work for them and do what they expect. Other people want options and configurability. Linux is very rapidly approaching the ability to provide both of these. People also want to have their PDA, phone, MP3 player, and GPS all on one device. Linux has the potential for doing all of this. And people are in love with mobile phones. Linux on mobile phones is what will make all of this work. So there’s my prediction, and where it comes from. (03:11:37 PM) My Friend: blogged. (03:14:32 PM) Scott: Just read the whole thing, man… that is all too cool. (03:15:10 PM) My Friend: Linux is like marriage…. (03:19:41 PM) Scott: Windows is like being chained to a wild boar with barbed wire by the nut sack. Let’s face it, Linux is better than Windows. Actually, rather than open that can of worms, I would like to supply just one of the tons of reasons that I believe many system administrators would prefer Linux. When you are trying to troubleshoot a problem, information about that problem is invaluable. Take, for example, the logging capabilities of the proprietary alternative. 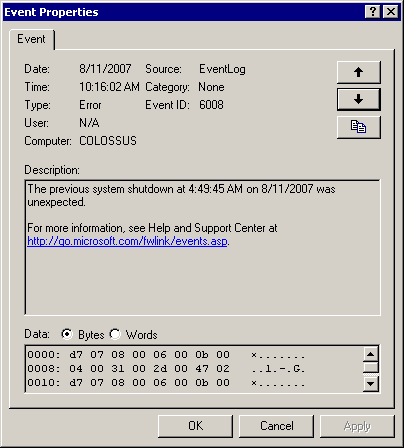 Hmm… “The previous system shutdown at 4:49:45 AM on 8/11/2007 was unexpected.” Congratulations, thank you for that insightful bit of noteworthy and informative enlightenment. I had no idea that the shutdown was unexpected, even though that is PRECISELY why I am sitting in front of the computer to begin with. In other words, the “Event Log” on Win32 platforms is technically correct, but absolutely useless. In Linux, I can go to any one or more of several different logs, and I can even create my own should I so choose. We have /var/log/messages as the main system log. There are also others, like the mail log, the apache log, the php log, and the database log. Should I write a script that has custom output messages, I can send them to any other output file I wish by using the “>” symbol and redirecting the output to that file. Without helpful and informative logs, I would likely not have been able to solve issues such as this that cropped up last September. Helpful, detailed, descriptive, informative debugging and error logs: yet another reason to use Linux. 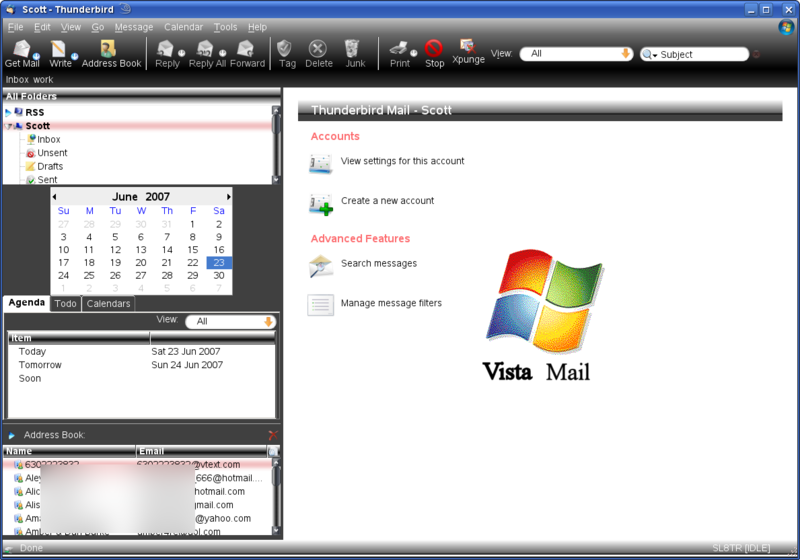 Heh, did you hear about how Vista was attacked by a 13-year-old virus?! That would have to qualify as another spectacular reason to choose Linux over proprietary systems. You’re less likely to get viruses. Eyecandy is one of my favorite things. Ask Steve or Jason. I love for stuff to look just really slick. 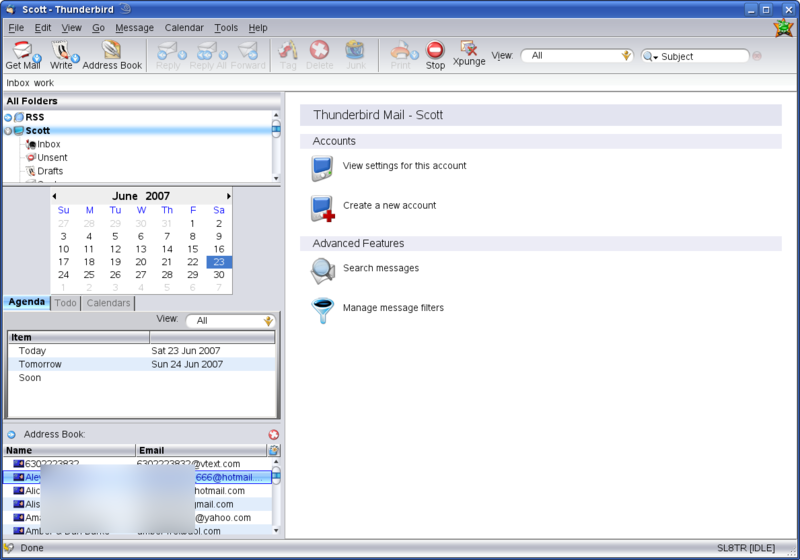 So I’m going through this Thunderbird article called “10 must-have Thunderbird Addons (+ 25 more) because I also like wicked-sick plugins with all the coolest stuff because I get extremely bored very quickly. After getting all the totally rocking extensions, I came back to the sexiness of the whole thing. If I could make my Thunderbird look like the Viper that I’ve always wanted, I’d be totally set. Pulling up the theme page on mozilla.org, lots and lots of themes jumped out at me. 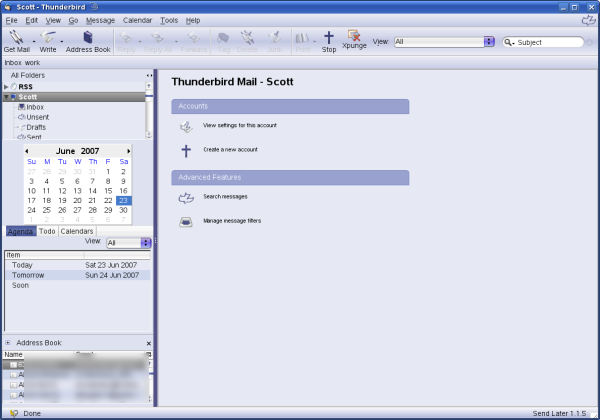 Granted, not all of them are compatible with Thunderbird 2.0, which is what I’m using. Nevertheless, I decided to download the most popular themes that are compatible with T-Bird 2 and give ’em a spin on my desktop here. After a few moments, it became apparent to me that I could just as easily rush through it and quickly pick something on an impulse that appealed to me and call ‘er good. On the other hand, the possibility existed that we could go through them one by one, make a little spreadsheet with some criteria on it, and grade them on the things that are important to me, in the way that I perceive them. Because it is so subjective and highly personalized, it would come as a surprise to me if this information were useful to anyone but me. Nevertheless, the possibility that one person may find it useful and beneficial is enough for me to pour my heart out. Thus, I leave it in your hands to be exceedingly thankful for my generosity. edges/borders – The borders of the widgets cannot just end. They must have a proper border. This is how the eye knows where the widget ends. Otherwise, it looks like an unfinished paint project. You must have a proper border for it so that it can be properly placed and balanced by the eye. It cannot look sloppy. * claps hands twice * Please, people, sit up straight in your chairs. The weight for this one is 4.
thumb scroller – Drives me to drink how these people think that they can design a spectacular theme and then get away with a stupid-looking thumb scroller! Please. That is one of the most used parts of the theme. Everyone always scrolls everything. That’s one of the most known laws of the Universe. Thusly, the thumb scroller must look good. Preferrably rounded edges, but at least look clean and crisp. The weight for this one is 6.
crisp – ‘Sloppy’ will not cut it around here, people. You must be on the ball. Er… It just makes me a little twitchy when things aren’t neat and clean placed properly precisely where they go. They should also look like they fit there, not like they were jammed into that spot. The visual mass needs to be spread around properly and carefully and precisely. Don’t just vomit on some Saran Wrap and be all Emo and think you have a cool eclectic theme. Do it properly and neatly and cleanly. The weight for this one is 6.
professional – When at work, it may be nice to use a theme that would impress a guy who owns three private jets, a yacht in the Andes, and 20 Jamaican snow mobiles. Er… it would be nice to appeal to a professional businessperson. Like some dude who owns his own corporation and has like 14 NFL rings on all his fingers and stuff. 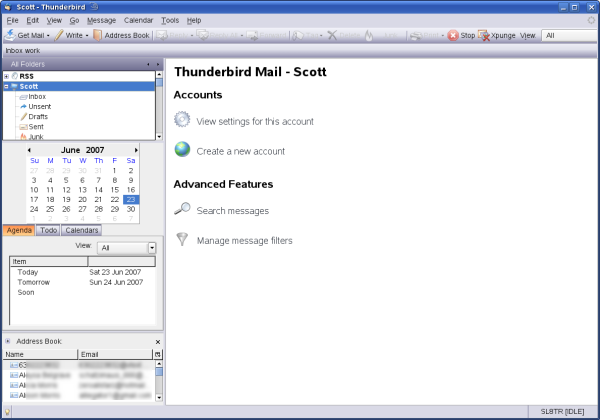 If you can make that guy double-take on your Thunderbird theme, you are officially “with it.” It has to look organized with no extreme coloration. Professional people do not need any further explanation and will already know precisely what I mean, because that’s part of who they are; they just get this type of thing. The weight for this one is 8.
highlight/selection – Another quite serious mistake people make is that their whole theme rules, except the hightlight looks like a piece of masking tape pulled off a used bandaid. Come ON. If you make enough effort for the rest of the theme to look nice, please understand that the highlight is one of the most viewed parts of your theme. When you click on something, it highlights. When you roll over something, it highlights. Your eyes usually follow your mouse around the screen, and because that’s the thing that does the rolling over and clicking, your eyes are looking at the highlights a large part of the time. See how that works? The highlights must look nice, polished, and slick. The weight for this one is 7.
use of color – Whether it is monochromatic, triadic, or synchronous, the colors must jive well together. Of course for me, the interpretation thereof is done by my very own eyeballs. Thus, the grade on this one will be what I think about how the creator used color with their theme. The weight for this one is 7. The score for each category will be multiplied by the weight for that category. Each of these values will then be added all together for a total overall “Weighted Score.” With all of this deeply explanatory psychological underlying subliminally entrenched childhood tragedy now thoroughly worked out of my system, it may very well be possible to jump right into the cool stuff. With that, here we go. All in all, these top 10 themes all have their strengths. Some of them have some more obvious flaws than others, but overall, they provide a collection of 10 great themes to have. Again, this evaluation was made solely according to my tastes. Take a look at the link to the themes I provided above. There are quite a bit more than the ones I covered here, but these are the 10 best according to my criteria, grading, and weights. Hopefully, this has been a somewhat insightful demonstration of a perfect way to waste 3 hours of your day. I took down the post that was giving everyone heartburn, ulcers, and all other forms of negative karma. I’ll be honest, I did it for the reaction. I did save the comments before I deleted it, though, so that I could learn from the helpful suggestions of those not willing to stoop to my level. I’d go more into my compartmentalization issues, and how it’s a lot like multiple personality disorder, but seriously, I doubt I could make it make sense. Anyway, I’m gonna try and keep it a little more mainstream from now on and steer clear of the extremely negative posts. To be completely honest, that particular post was mainly for my own benefit. I am still annoyed that I am unable to browse to a remote machine to save a graphic out from the GIMP. I don’t want to use Krita. I will look into it, but I like the GIMP and I want to be able to do it there. I know that Gnome can browse to remote filesystems. That was not the complaint. My beef was solely that the GIMP cannot (at very least by default) do what I want it to. If so, point me to the documentation, tutorial, or howto that demonstrates how to do this. If not, well, then I’m right and it still annoys the crap out of me. I promise to have a post up very soon that will make us all friends again. As a matter of fact, it’s more like an extended tutorial. Alrighty, then, we’ll chat later. I leave it open all day, looking just like that. This way, when the Windows users walk by and see it and ask what it is, I get some small satisfaction (that I totally shouldn’t get) from telling them that it doesn’t run on Windows, and that this means that they can’t install it. What brings an eventual grin to my face is the immediate look of confusion that appears on their face because they have absolutely no idea what I just said. So here’s my take on beryl. When people ask me whether I think Linux is ready for the desktop, I whip out beryl. Now, just because it can flash and dance does not mean that it is necessarily ready for the desktop. However, if the community feels that something like beryl is practical to develop, the rest of the desktop requirements must be fairly well met. Which, of course, I can tell you that they are. What is even more incredible is that Mac has had animated desktops for a few years now, and Linux does stuff with beryl that will send you into seizures (good ones, of course!). Both of them are far superior to their common competitor. And that competitor is having trouble keeping up with the features. IE 7 just got tabs, for example, which of course have been available in Firefox for a long time. Vista has its new Aero effects, yes. However, they are mainly available only in the enterprise/professional versions? How does that make sense? The enthusiast is the one who will be interested in that stuff. Which means the HOME users. At work, people are expected to work, and not play with accelerated desktops. CEOs won’t give a rat about Aero, other than hating it because people are not able to work, but are distracted with all the eyecandy (I use the word “all” kind of tongue-in-cheek, as it doesn’t hold a candle to beryl). Nice. Give it to the people who don’t care, and take it from the people who do. Whatever, I am absolutely digging my beryl install on my openSUSE 10.2 laptop. If you haven’t had a chance, head over to youtube or something and check out some of the beryl demos. Can I just tell you how much I hate school? I got a new ’04 Crown Victoria Police Interceptor. I’ll have to post pictures some day. 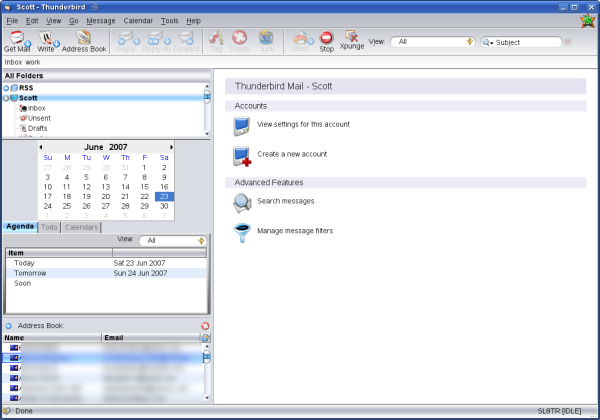 Some while back, our company was looking at getting a new mail server. At first, we were considering the open-source version of Zimbra that runs on Linux. Well, after a licensing fiasco with them, we decided to use Exchange. I just about quit. We got this hugely beefy system to run it on. 4gb RAM, ~400GB RAID5 (after raid there’s that much), dual xeon procs, not sure the speed. Actually, I DID get that error from the Exchange server. No resources available to send my text-only email of 2 sentences in size on such a massively overpowered machine. Maybe it’s because it only has half the resources that Exchange requires? Never got anything remotely like that from the Zimbra install on the Linux box. But hey, we HAVE to have the calendar and shared contacts, otherwise we may end up as PHB’s. Ya’ll have a spectacular weekend. openSUSE Linux 10.2 all the way. Every once in awhile, something surprises me. Take Friday night, for example. I knocked the 1-Liter bottle of Coke over and emptied half of it into my keyboard, then got it all over the wall behind me, then all over the underside of my desk, all over my monitor, and all over about 40 square feet of carpet, all within about 12 seconds. I was surprised that none got on my laptop. Saturday, however, was not a day of much surprise in my life. I woke up and set up three domains with Drupal installations which went exactly as planned. I ate some lunch, and drove from Eagle Mountain to Logan, which trip was totally uneventful. My brother and I presented our father with a new AMD Athlon 64 X2 Dual Core 3800+ machine that we got him for his birthday. He was excited and surprised, which came as no surprise. I fired the machine up, yawning in boredom at the new look (as interesting as watching paint peel when I have compiz/beryl on my Linux laptop with all the transparencies and stacking and burning effects). After waiting about 20 minutes for the machine to get to the desktop (if it comes installed, what the hell am I waiting for? ), it assaulted me with virus definition updates, windows updates, the welcome screen, and a migration wizard. After freeing up about 200 Meg of RAM by closing all these windows, I decided to go ahead with the Easy Transfer window. I wanted to tranfer all of the files, data, settings, email, etc., from the old machine to the new one. It prompted me how I wanted to do the transfer and if I was on the old computer or the new one, and if I had the Easy Transfer app installed on the other computer, which I did not. No problem, it gave me the choice of putting the Easy Transfer app onto a USB stick and putting it on the old machine, which was on the same network as the one. Getting it over onto the old box and running it was fairly painless. After about 25 minutes it just gave me this error, “Easy Transfer Failed: permission denied”. Permission to what? From where? What were we trying to do? Which program was denied the permission? On which computer? Regular old questions such as these which are very easily answerable on a Linux system were apparently not even considered by the Windows developers. They were probably all like, “Dude, you can’t even fix it, anyway, so why do you even care what went wrong?” Seriously, that is a great point. I tried it twice, each with the same result. Yes, I had all usernames and passwords typed in correctly (yes, caps-lock was off). Obviously I had erred as an operator (You should see this great PEBKAC shirt that I have. I wore it to work on Friday). Fine. HOW!?! Give me something useful so I can make it work as it should on its own anyway. So I hopped on the new box and logged into my dad’s account. It had gotten at least some of the data transferred because all of the files littering the old computer’s desktop now showed on the new computer’s desktop. Verify the switch I am using, huh? Nice. Oh, and apparently, OE doesn’t even come with the OS anymore. All I had was some time-limited trial of the latest Office that would expire in June. Which means that I had to try and work with Outlook. Fine. When I did finally find the actual executable for Outlook so I could run it directly (as according to this error that came up, basic things such as SHORTCUTS don’t work properly), again, an onslaught of prompt boxes appeared. They were warning me that this was a time-limited trial and that I had to put in some registration key and that I had to agree to the EULA, and if I wanted Outlook to be my default mail client, and if I wanted to check for and install updates. 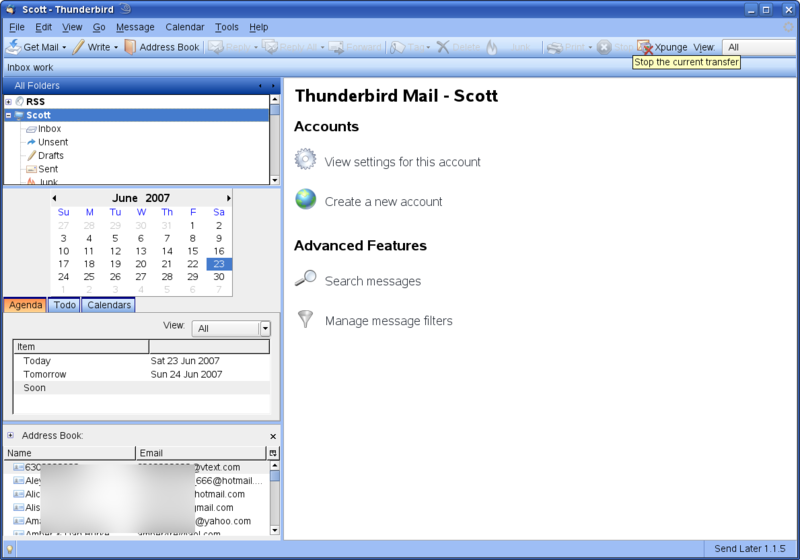 After mopping up the screen, yet again, of the plethora of windows, I went to try and import the Outlook Express accounts, messages, and contacts. You would think that since the same company wrote both programs, and that since both programs have similar functionality, and that one is supposedly the EXPRESS version of the other one, that it JUST MIGHT be able to perform such an import. You would think. Unknown error. Reinstall. Yep, no surprise. Exactly what I expected from M$. After screwing around with that for another 15 minutes only to get the same error no matter what, I had a thought: “Why not use Thunderbird? It does the trick on Linux!” So I grabbed the Thunderbird installer, threw it on there, and ran it. It installed just as I expected it to. Before it was completely finished with the installation, it asked me if I wanted to import accounts, messages, and address book from Outlook Express accounts. 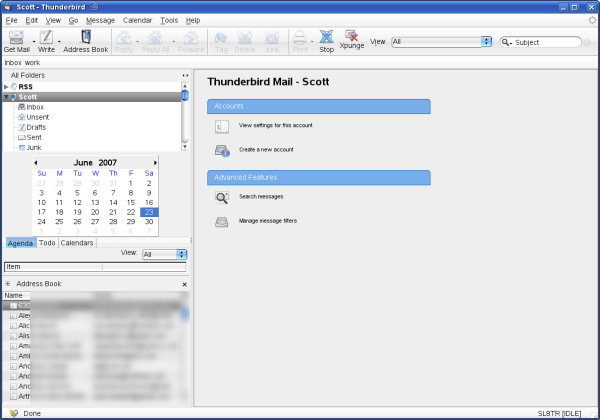 I sat there and stared for a moment, until I realized that, of course Thunderbird would do this. It is open-source and designed to work. No surprise there. Before I had even run it the first time, it had already done everything I wanted it to do. Let’s see here, to transfer personal settings and data from one Linux box to another one… what would I do? Copy the /home folder over from the old Linux machine to the new one. The end. This is reminiscent of an experience I had awhile back where my co-worker needed Linux to fix a broken Windows box. This provides the perfect transition into my next point. It used to be that you wouldn’t really see articles like this one, called “Microsoft is Dead.” He has a point. When was the last time you heard about some ruthless, hostile takeover by Microsoft like back in the good old days when they’d do anything to destroy the competition? They’ve had their day, and Vista is their first debilitating (albeit self-inflicted) blow. Nothing like a monopolistic company whose arrogance and complacency causes them to kneecap themselves. Your best bet is to just forget about Vista and try out openSUSE or some Linux distribution for your desktop and server needs. Yes, Linux has gotten much better over the past few years. Remember that it’s advancement is accelerating more and more while Windows’ has all but flat-lined. Surprise! Linux marches on. 145 mph 18″ from my face. This was inevitable. It would have happened sooner or later. I’m sure that everyone has heard by now about Dell’s support of Linux. They will start selling PCs preloaded with Linux in the near future. What’s interesting is that everyone is all shocked. For a few years, now, Linux has been building momentum. Once Microsoft did its thing with Novell, that was kind of the beginning of a new era for Linux. To me, it felt more like Microsoft was basically just saying, “If you can’t beat ’em, join ’em.” They seemingly figured that in the long run, it would be more cost-effective to partnership with Novell around Linux than it would be to continue a losing battle fighting against it. They changed from the “Linux is a cancer” mind-set to a co-operative strategy. It still feels to me like they’re saying, “If Linux is going to encroach on our territory, we will control the one with the largest market share.” But Novell does not have the largest market share of Linux installs. That is correct. They don’t. YET. With Microsoft at their back, Novell will eventually enjoy a nice pass to the head of the line of enterprise Linux distributions. By then, Microsoft will have established an influence over the development of that distro. And, of course, they come out on top. Again. All that aside, another side effect of the M$/Novell thing is that way many more people are going to be using Linux in general. More people will be hearing of it and will start using it. This has already started happening. This is evidenced by the survey that Dell put out recently. They wanted to take the community’s pulse with regards to pre-installing Linux on the PCs they sell. What distro do you think they will put on these home and business desktops? I am betting that it will be SUSE Linux Enterprise Desktop 10. It is a solid system that is very easy to use. Throw an eyeball at a blog post I did on SLED 10 a while back. They really tied it down and made it a solid desktop. In my experience, it is the only logical choice. 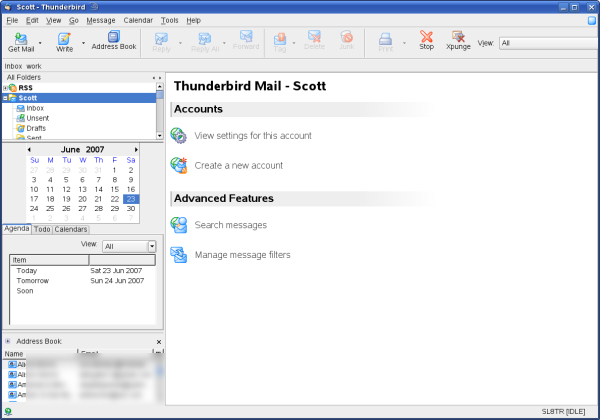 It does all the regular stuff: email, word processing, spreadsheets, web browsing, or instant messaging. It is cheaper than Windows. 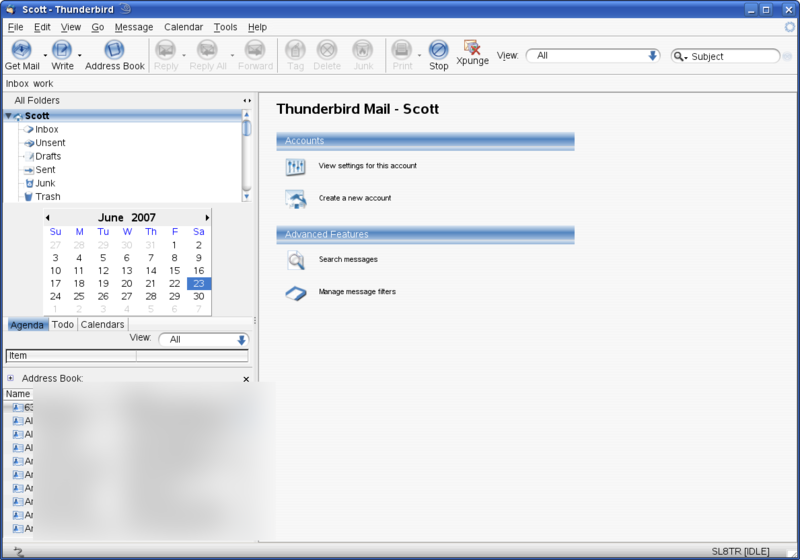 It offers a full productivity suite in OpenOffice.org 2. It doesn’t even need antivirus software. Best of all, it integrates into an existing Windows-centric network. Which means compatibility with Exchange. This is another feather in the cap of the future stability and growth of Linux. What’s more, even if you don’t think Linux is quite up to par now, it is only getting better. Things are only looking up. This is one of the reasons that I have put together a free Intro to Linux course. It is for people who want to get started using Linux, but may not know how. The course is available from my blog. If you want to enroll, please feel free. For people you know who are interested, have them take a look. Anyway, with the M$/Novell agreement, and now Dell making this new change, expect Linux to become more widespread (this does not mean that this is the year Linux takes out Windows). Expect other companies to make similar changes. It will happen. My friend Jason, his brother Ryan, and our friend Mac all went to the Salt Flats the other weekend and I shot some video of them doing some SICK spinouts, burnouts, and other stunts in their Mustang GTs (Ryan’s Mustang is mid-90’s, and Jason’s is a brand new 2007). What a couple of sick puppies. Well, so Jason took the footage and mixed it all together and posted it up on Google Videos. Blow my eyes out. By the way, in some of those shots, they are going by me at 140 mph about 18 inches from my face. Yes, they are. I was there. I know that because when I watch the video, I can hear my voice. OK, so Christmas was great and everything. Presents and family, and honey-roasted ham… we spilled no fewer than 3 drinks on the dining-room floor that I personally mopped this very morning. No idea how many were spilled on the carpet. Much fun was had by all. I also wanted to talk about RSS. This, to me, is the single greatest means of transmitting useful information that there is besides email. And maybe instant messenger. Really briefly, RSS means “Really Simple Syndication”. It’s like a channel to which people can subscribe to receive the latest content on a given website. It is great for news, blogs, forum threads, or anything else that may be time-sensitive. You simply copy the URL of the RSS feed and paste it into an aggregator. This program then downloads and parses all of the RSS feeds to which you are subscribed. It may then give you ways to manage the articles, search through them, or whatever else. In any case, RSS is the man. RSS feeds initially hit my scene around July of 2004. The first aggregator on my machine was RSSOwl. It had lots of great features but it seemed like it crashed a lot. Akregator was the next RSS reader installed for trial. It seemed usable enough. There were a couple of bugs, which I reported, but overall, it was very usable. It fared much better than RSSOwl, but couldn’t filter things very well. What it does offer is the ability to search through the feeds, but does not allow one to save the searches for availability later. That annoys the snot out of me. It also does not allow direct filtration. Again, I need a box of Kleenexes. Overall, Akregator does seem quite a bit snappier and more responsive. It does all of the basics really well. It definitely misses some of the essentials, such as filters and saved searches. I then learned that Thunderbird could aggregate RSS feeds, and would let me filter them into different folders, too. Ever since ths fact was discovered, my RSS feeds have been aggregated by nothing else. Thunderbird allows for import and export of the feeds in an OPML file (which most aggregators do now). Mostly, I appreciate it and use it because of its rule-based filters and its stability. 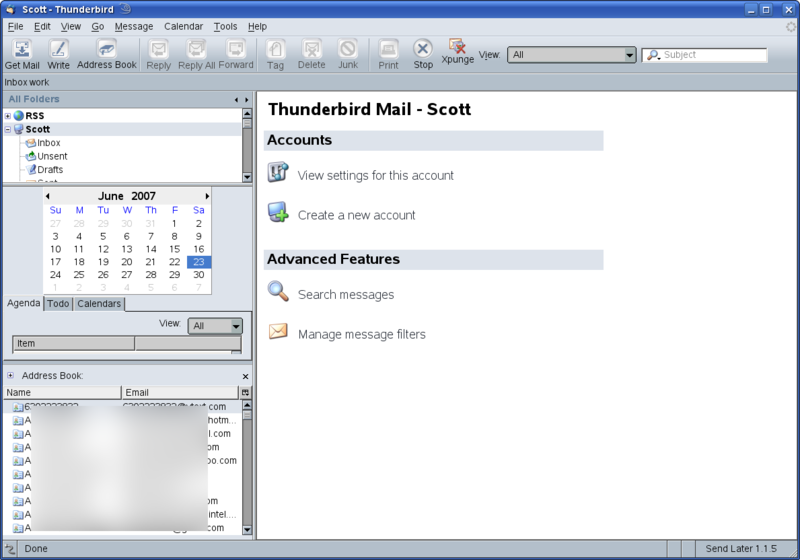 Two huge beefs I have with Thunderbird: 1) It is slower than mold growing uphill in Winter. As we already know, waiting gives me cancer. And 2) When I have “Unread” selected in the filter bar at the top, and I go into a given folder containing feeds, it doesn’t only show the Unread news articles. It shows them all. Sometimes, I have to click around on different folders and come back to even show any at all, when I know darn well it’s full of them. Thunderbird is agonizingly slow as an aggregator, and has some funky bugs that really shouldn’t be there. However, I do greatly like the filters. I have also taken a look at Liferea. It has some excessively cool filtration, searching, and the ability to save searches as virtual folders. 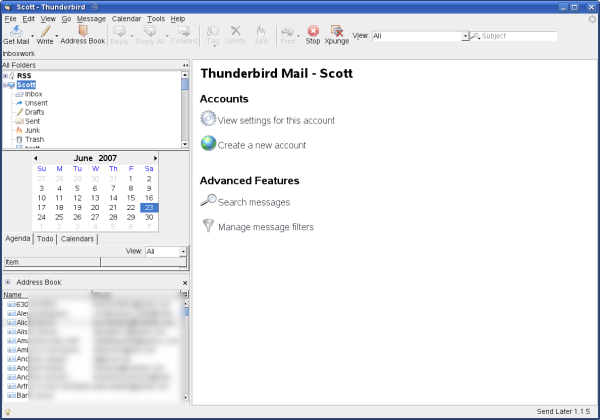 It is quite a bit more responsive than Thunderbird, but not quite as much so as Akregator. It is also quite unstable on a 64-bit machine, and crashed 4 times just tonight. Overall, I think it has the most of the features that I personally am looking for. RSSOwl found its way onto my machine again, tonight. It seemed like it would be a good idea to see how far it had come in the last couple of years. To be honest, the stability had improved quite dramatically. RSSOwl had redeemed itself and had made quite a positive impression. Unable to make up my mind, it was time for the old comparison spreadsheet trick. The first task was to come up with some criteria that were important to me personally. Next, a weight was given to the importance (to me) of each criterion. Having done that, I listed all of the aggregators that were to be tested. We had a bullet-proof system (or something) for selecting the best aggregator. Below is a graph with the results of my evaluations of each of the aggregators. In the first column is each of the criteria. In the next column is how important that particular criterion is to me personally. Then there are the individual aggregator columns. In the left column is my grade for that aggregator. In the right column is my grade multiplied by the weight. At the bottom of each column is the total score for each aggregator. The image links to a spreadsheet that you can download. If you want, you can adjust the importance of each criterion to see which aggregator may fit your needs the best. I also checked to see how long it would take to start up. I instructed each aggregator to download all feeds upon startup. The startup times listed below thus include the time to start the application and download all RSS feeds. As it appears that Liferea is my favorite RSS aggregator in terms of functionality, it is way too unstable for a 64-bit machine. 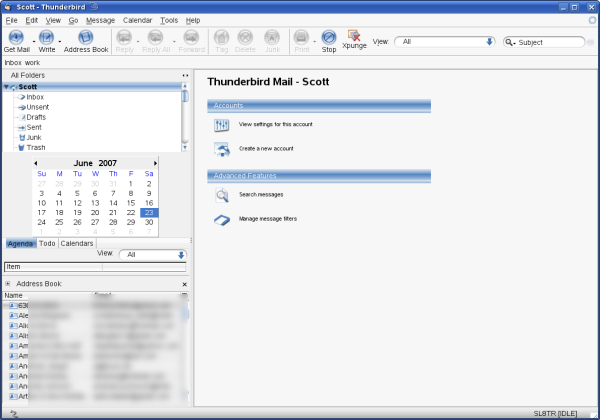 Second most interesting to me is Thunderbird, which I have been using for about a year and a half. RSSOwl and Akregator are fine, but lack some necessary functionality, though they are both stabler and more responsive than Liferea and Thunderbird. One of my very biggest problems is that I have about 150 RSS feeds to sort through. That is quite a bit of information overload. Hence the need for good saved searches or virtual folders. Now for the big question: What slick little tips and tricks does anyone have to manage your RSS feeds, search through them, sort them, or otherwise optimize your experience? Any thoughts on managing the information overload? I’m hoping that someday, someone will come out with Bayesian filtering for topics. That would be very helpful for me. In the meantime, please share your pointers.